You are currently browsing the category archive for the ‘math.FA’ category. A basic problem in harmonic analysis (as well as in linear algebra, random matrix theory, and high-dimensional geometry) is to estimate the operator norm of a linear map between two Hilbert spaces, which we will take to be complex for sake of discussion. Even the finite-dimensional case is of interest, as this operator norm is the same as the largest singular value of the matrix associated to . Schur’s test (4) (and its many generalisations to weighted situations, or to Lebesgue or Lorentz spaces) is particularly useful for controlling operators in which the role of oscillation (as reflected in the phase of the coefficients , as opposed to just their magnitudes ) is not decisive. However, it is of limited use in situations that involve a lot of cancellation. For this, a different test, known as the Cotlar-Stein lemma, is much more flexible and powerful. It can be viewed in a sense as a non-commutative variant of Schur’s test (4) (or of (1)), in which the scalar coefficients or are replaced by operators instead. and the upper bound in (6) then follows from a simple computation. whenever . (The first identity asserts that the ranges of the are orthogonal to each other, and the second asserts that the coranges of the (the ranges of the adjoints ) are orthogonal to each other.) By replacing (7) with a more abstract orthogonal decomposition into these ranges and coranges, one can in fact deduce (8) directly from (9) and (10). the point of the Cotlar-Stein lemma is that the dependence on in this bound is eliminated in (13), which in particular makes the bound suitable for extension to the limit (see Remark 1 below). The Cotlar-Stein lemma was first established by Cotlar in the special case of commuting self-adjoint operators, and then independently by Cotlar and Stein in full generality, with the proof appearing in a subsequent paper of Knapp and Stein. The Cotlar-Stein lemma is often useful in controlling operators such as singular integral operators or pseudo-differential operators which “do not mix scales together too much”, in that operators map functions “that oscillate at a given scale ” to functions that still mostly oscillate at the same scale . 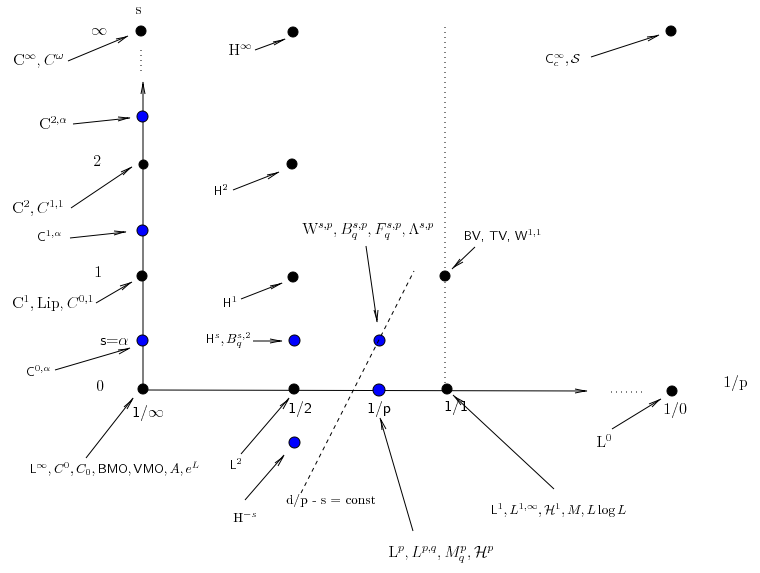 In that case, one can often split into components which essentically capture the scale behaviour, and understanding boundedness properties of then reduces to establishing the boundedness of the simpler operators (and of establishing a sufficient decay in products such as or when and are separated from each other). In some cases, one can use Fourier-analytic tools such as Littlewood-Paley projections to generate the , but the true power of the Cotlar-Stein lemma comes from situations in which the Fourier transform is not suitable, such as when one has a complicated domain (e.g. a manifold or a non-abelian Lie group), or very rough coefficients (which would then have badly behaved Fourier behaviour). One can then select the decomposition in a fashion that is tailored to the particular operator , and is not necessarily dictated by Fourier-analytic considerations. Recall that when we applied the triangle inequality directly to , we lost a factor of in the final estimate; it will turn out that we will lose a similar factor here, but this factor will eventually be attenuated into nothingness by the tensor power trick. Sending , we obtain the claim. Remark 1 As observed in a number of places (see e.g. page 318 of Stein’s book, or this paper of Comech, the Cotlar-Stein lemma can be extended to infinite sums (with the obvious changes to the hypotheses (11), (12)). Indeed, one can show that for any , the sum is unconditionally convergent in (and furthermore has bounded -variation), and the resulting operator is a bounded linear operator with an operator norm bound on . Remark 2 If we specialise to the case where all the are equal, we see that the bound in the Cotlar-Stein lemma is sharp, at least in this case. Thus we see how the tensor power trick can convert an inefficient argument, such as that obtained using the triangle inequality or crude bounds such as (15), into an efficient one. and the claim follows from the tensor power trick as before. On the other hand, in the converse direction, I do not know of any way to prove the Cotlar-Stein lemma that does not basically go through the tensor power argument. (Eigenvalue) There is a non-trivial solution to the equation . (Bounded resolvent) The operator has a bounded inverse on . Among other things, the Fredholm alternative can be used to establish the spectral theorem for compact operators. A hypothesis such as compactness is necessary; the shift operator on , for instance, has no eigenfunctions, but is not invertible for any unit complex number . The claim is also false when ; consider for instance the multiplication operator on , which is compact and has no eigenvalue at zero, but is not invertible. It had been a while since I had studied the spectral theory of compact operators, and I found that I could not immediately reconstruct a proof of the Fredholm alternative from first principles. So I set myself the exercise of doing so. I thought that I had managed to establish the alternative in all cases, but as pointed out in comments, my argument is restricted to the case where the compact operator is approximable, which means that it is the limit of finite rank operators in the uniform topology. Many Banach spaces (and in particular, all Hilbert spaces) have the approximation property that implies (by a result of Grothendieck) that all compact operators on that space are almost finite rank. For instance, if is a Hilbert space, then any compact operator is approximable, because any compact set can be approximated by a finite-dimensional subspace, and in a Hilbert space, the orthogonal projection operator to a subspace is always a contraction. (In more general Banach spaces, finite-dimensional subspaces are still complemented, but the operator norm of the projection can be large.) Unfortunately, there are examples of Banach spaces for which the approximation property fails; the first such examples were discovered by Enflo, and a subsequent paper of by Alexander demonstrated the existence of compact operators in certain Banach spaces that are not approximable. I also found out that this argument was essentially also discovered independently by by MacCluer-Hull and by Uuye. Nevertheless, I am recording this argument here, together with two more traditional proofs of the Fredholm alternative (based on the Riesz lemma and a continuity argument respectively).